I got a SIMH MicroVAX 3900 instance loaded with the latest 2018 NetBSD/vax 8.0 on a Raspberry Pi 3B+ running Raspbian Stretch Lite 4.14.79-v7+ armv7l GNU/Linux. The VAX has two Digital RA92 disk drives and two Digital DELQA Q-Bus Ethernet Controller network adapters. My usual practice is to keep DECnet and IP networks separate; the first DELQA talks IP and the 2nd DELQA will perhaps talk DECnet, or at the least LAT, if this NetBSD port of the latd daemon from DECnet-Linux works (I will write about it in a future blog post if it does). The virtual SIMH network adapters are connected to the Raspberry Pi host using VDE (virtual distributed Ethernet) which is natively supported by SIMH (see SIMH ini file later down). 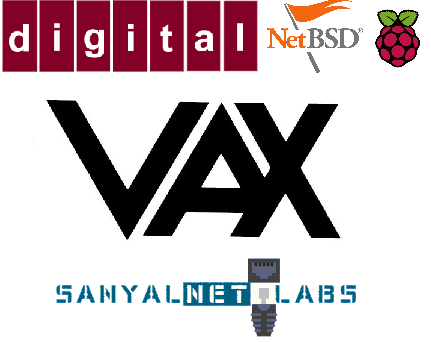 SIMH stable 3.9 source code was downloaded and compiled using the following command line which I have described previously in "How to Build Your Own Digital DEC MicroVAX 3900 Running OpenVMS VAX VMS Operating System: SIMH on CentOS 7 Running OpenVMS/VAX 7.3". # Bridge, VDE and Tun/Tap Network Device Setup Script to run emulators. # you retain this notice you can do whatever you want with this stuff. # me a beer in return. ; Define disk drive types. RA92 is largest-supported VAX drive. ; using a construction like "set rq2 disable" if desired. ; determined by whether auto-boot is set (see "dep bdr" above). ; SET CPU SIMHALT will cause the simulator to get control instead. Finally, the MicroVAX 3900 was booted up from CD-ROM ("boot dua2" in SIMH) and NetBSD/VAX installation started. The actual NetBSD/vax 8.0 installation process on the DEC MicroVAX 3900 was well designed, user-friendly sensible with no surprises, though it takes a bit of time for the full installation (hours!). The installation screens are documented extensively at NetBSD Example Installation. It was fun to finally boot into a classic Microvax 3900 running a modern and current NetBSD for VAX operating system. Here is a little video of the experience.